I'm not sure if this can be done or is not implemented yet but it would be nice if the regular pages had a permanent A or B or C on each so you could see which master page they were tied to without having to hover your mouse over each page. Also, as you can see from the image I posted for some reason it is putting a space between each paragraph. I'm sure it is an easy fix I am just not smart enough to know where, or how to fix it. That spacing would be setup in whatever Paragraph Style you're using, I think. But you didn't include enough of the screen to see what that might be, and you don't have the Text Frame selected, which would show it on the Context Menubar. I went back and took a full screen shot and even with the text box selected it still does not show what master page is selected for which page unless you hover your mouse over the top of it. I searched through all the paragraph styles and did not see anywhere to remove the space between paragraphs. Sometimes I guess I need things explained to me like I am a 6 year old. Quick update, figured out how to remove space between same paragraph styles but see nothing if the two paragraphs are different styles. No, there's no way to tell what Master is applied other than hovering over a page. Or, you can find that style listed in the Text Styles panel and double-click on it to open up an editing panel with the full details. By the way, your Text Frame is not large enough for all the text you've placed in it. That's indicated by the red "eye' icon. 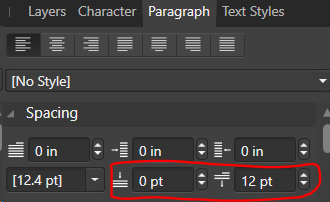 If you shift-click on that icon Publisher will flow the text that doesn't fit into additional frames on added pages, using the same Master page(s) as the current page you're working on. Yes, I know my box is not big enough and I understand the red eye. My main goal though with this screenshot was only to learn how to remove the space and ask about the master pages. I would use the Text Styles panel and edit the two (or more) styles to be certain that there is no space before or after paragraphs set. As a temporary work-around, you could put a 10~15% gray letter watermark on your master pages to show which ones have been applied. The watermark is easily removed for printing when you have finished the job. The example below includes the page number field, but you don't need that. It would be a nice option, to me, for not displaying a thumbnail image of the page and only show the master page(s) applied. In ID, I shut them off (especially in a catalog or otherwise memory intensive document) and in Q there are no page thumbnails in the Page palette (though there are in another place which I don't use). You can also make a Character Style in whatever colour or shade of grey you want to work with and then change the character style colour to white or "none" when you are finished. "None" might be safest with some print processes, deleting it off the master pages would be safer still. Then there is no extraneous (unused) code hanging around. These symbols are handy for applying a quick change in one character, to all other characters that have the same style applied.